Phillips’s organic farm will be bringing certified organic Swiss chard, mixed salad greens garlic, dill, yellow beans and Pat Lapoint vinegars. Peg’s Produce will be bringing farm market bouquets, yellow and green zucchini, cucumbers, Swiss Chard, green beans, fresh yellow Spanish and Red Defender onions. J&W Farm will have Sweet Corn and vine ripened tomatoes and their other great veggies. Ma Fille Bakery will be bringing peach pies, blueberry pies, strawberry rhubarb pies, donuts, chocolate whoopie pies, pound cake. Mellander Maple, Nice Farm, Mackenzie Farms and Dave’s Natural Honey will also be there. Our entertainment for the day is Ernie Lawrence on guitar. Dave the Honey Guy will have their honey along with a full complement of flavored honeys. Nine different flavors in all. They will also have a limited amount of honey butter in regular and cinnamon. Nice Farms will have peaches, Blueberries, sweet cherries, Raspberries, Apricots, their pork and Maple products. Peg’s Produce will be there with farm market bouquets, gladiola, yellow and green zucchini, green beans, beet greens, Swiss chard, and fresh Spanish and Red Defender onions. Mackenzie Farms, Mellander Maple and J&W Farm will also be there. Our entertainment for the day will be Denise Duthe playing her beautiful harp. Saturday looks like it will be a beautiful day to shop at the market! GAMS Bakery will be there with muffin tops, hand pies, cookies, cinnamon rolls, cherry sweet rolls, banana bread, coffee, tea and water. Dave’s Natural Honey will be there with his honey products. Opies Gift Gallery will be there with reversible aprons, blankets, ties, and new facial wash cloths and dish cloths and much much more! 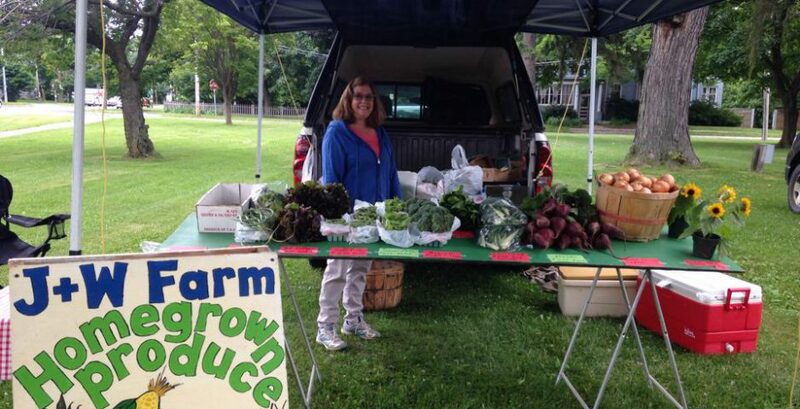 Peg’s Produce will be there with farm market bouquets, lettuce, Swiss Chard, and kale. Mellander Maple will be there with Maple Syrup, Once Again Nut Butters, Nunda Mustards and Catsups. J&W will be there with Summer squash, green beans, peas, lettuce, broccoli, cucumbers, beets. Nice Farms will be there with our sweet cherries, Blueberries, Raspberries, pork, beef, Maple stuff and dip mixes. They are bringing extra bacon this time they said! Ma Fille Bakery will be there with Chocolate Zucchini Cake, Chocolate Chip Cookies, Pound Cake, Smores Cookies, Peach Pies, Raspberry Pies, Brownies. Our entertainment is Folk ‘O the Road and the Office of the Aging is in our Community Booth with Farmer Market Coupons for income eligible seniors.